Repudiate is actually quite a big deal for me. It’s been a little while since we got a straight-up Stifle variant; this is simultaneously less flexible than Disallow due to only having one mode, but also more flexible due to having a fluid mana cost. At first glance, it looks like there won’t be much reason to shoehorn it into a deck with green but not blue. I’m not so sure about that – green decks don’t always have a good way to stop cards like Teferi. I completely expect both halves to be in high demand. 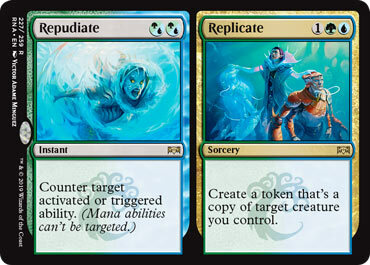 Repudiate might be the most interesting half of the card, as it is the wording on the infamous Stifle. While Stifle is maybe better at one mana than at two, the upshot is that green decks now have the ability to run the effect; it’s not been a common part of green’s bag of tricks (with Bind being the most famous instance), but it does have the ability to thwart abilities. And sometimes all you need is to stop an ability from happening once, like new Rakdos and his come-into-play ability. Or a planeswalker ultimate. If nothing else, Repudiate is a very powerful weapon. And if you need to close out a game, Replicate also is a thing. A three-mana copy effect is about as cheap as it gets, and while it can only copy one of your creatures, a second Carnage Tyrant is always a good means to end the game. I like the cheaper half more, but Replicate can end a game out of nowhere.